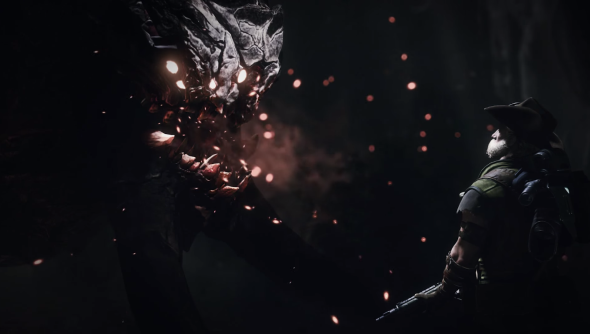 Fighting Evolve’s Behemoth is literally going to be like trying to get blood from a stone. The Behemoth is a massive stone monster that can roll itself up into a boulder and squish you flatter than Flat Stanley. I’ve no idea if the thing can bleed. The player in the trailer seems too intimidated to try and damage it. The trailer doesn’t give much away but the Behemoth looks to be able to exist in two forms, the boulder and the giant. As a boulder it’s able to roll around the map at speed, flattening anyone in its path. The down side is it’s not maneuverable. If it misses its target then it can’t just stop on the spot and roll back the way it came. As a giant it’s a slow, stomping beast but wicked strong. Its stony skin likely means it has a huge amount of health, too. The Behemoth is the fourth of Evolve’s monsters to have been revealed. First was the Goliath, a hulk of a beast that can leap about the battleground and tear fleshy creatures in two. Then there was the Kraken, a floating squid creature that can electrocute its prey. And, finally, before the Behemoth, was the Predator-like Wraith, the creature can go invisible and stalk its prey up close. Evolve’s release date is set for February 10.